Honeysuckle Blue is part of a larger Farm of the World initiative in which designers collaborate with educational groups to teach the age-old sustainable techniques of using plants for their dyes to create fabrics in beautiful colours. The garden invites the visitor to acknowledge that a legacy of knowledge about plants and their beneficial qualities is fast disappearing. 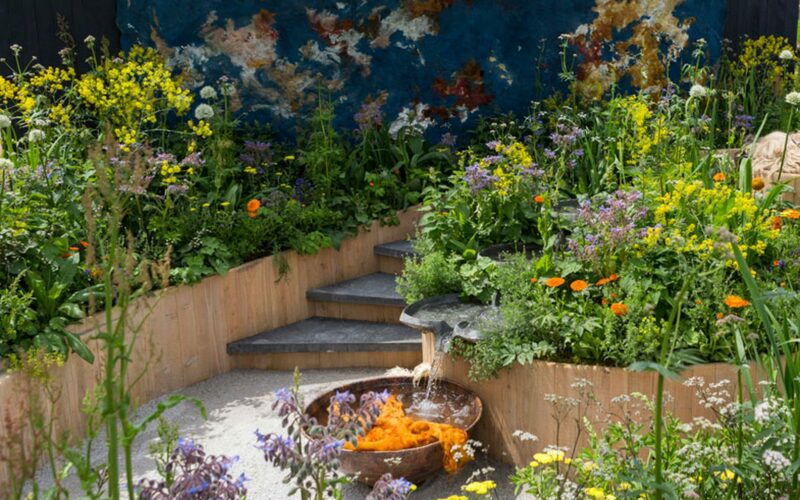 In this garden we can see the beauty of the plants that were historically harnessed for their dye qualities. Plant dyes produce tones that are essentially different, with depth, shades, nuances and movement. The colours are rich, alive and appeal to our innate sense of nature. We find these plants still have value and quality and the techniques that were once used are sustainable. This garden was made possible by AkzoNobel and the Embassy of the Kingdom of Netherlands in London. Designed by Claudy Jongstra and Stefan Jaspers. Built by Cube 1994. This Silver-Gilt Award winning garden was built by Cube 1994. Alongside the designers, the team worked together to plan every aspect of the build and ensure that everything would look and work as it should. The build then took 9 days; bringing the design concept to life. Watch the video to see the building process.